Sterner Automation has also developed a variety of calibration and communication products because of our involvement in automotive, primarily with occupant classification systems. Sterner Automation is a world leader in ECU interface systems and chances are that the car that you drive was talking to a Sterner Automation interface device when it was being built. These interface devices provide a reliable communication channel to the car intelligence that is normally not available at the machine control level. This added level of control increases the reliability of the system, and when dealing with vehicle safety systems, the added layer of control provides peace of mind. Today's automotive applications demand flexible integration tools to ensure test equipment can meet changing technological and communication requirements. 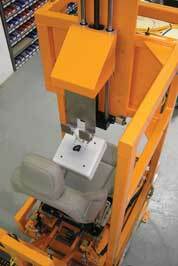 Sterner Automation has developed the next generation of testing interface solutions specially designed to address multiple technologies, including occupant classification systems (OCS). The Sterner interface box (SIB) provides our customers with the capability to efficiently operate, monitor and report on end-of-line (EOL) test equipment anywhere in the world. Sterner Automation has developed plant-ready test solutions for applications such as occupant classification systems (OCS), including our well-proven portable diagnostic tester (PDT). The Sterner PDT is customizable to technology-specific programs and was engineered to provide our global customers with the capability to immediately monitor, assess, and process data related to electronic control units (ECU). Critical occupant classification system (OCS) technologies continue to change, putting new demands on today's automotive seating manufacturers. Sterner Automation is committed to meeting these requirements by being the first to provide advanced solutions such as our unique thump zeroing drop machine (TZDM). This automated inline testing solution, combined with a Sterner interface box (SIB), provides the critical link needed to efficiently handle testing and reporting on these high performance systems any where in the world. The continued drive towards flexible vehicle production platforms and zero defect requirements are increasing demands on today's automotive seating facilities. Sterner Automation can address these challenges with a full line of occupant classification system (OCS) test solutions including world-class weight drop machines (WDM). 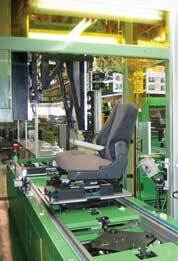 This advanced system design can be configured from standard modules that adapt to any material handling system and will dynamically adjust to suit particular seat test parameters. Coupled with a Sterner Automation interface box (SIB), these WDM testers provide our customers with the capability to efficiently adapt, monitor and report on test operations anywhere in the world.